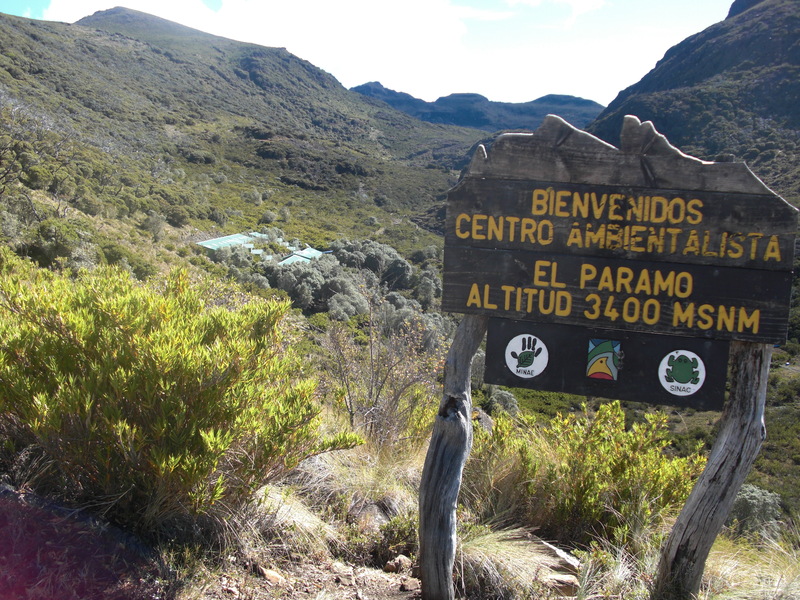 Nominal elevation gain: 2,300 meters (7,546 feet) – real elevation gain is more. Wore: Patagonia Release shoes, shorts, t-shirt. Carried (clothing): rain jacket, rain pants, thin capilene long-sleeve shirt, umbrella. Never used any of these. Carried (consumables): 2 cycling water bottles (half-full to start), granola, bars. Other: I used hiking poles and wore regular cycling gloves to prevent chafing. Time: Left trailhead on April 18 at 4 a.m., Base Crestones at 8:20 a.m., summit at 9:45 a.m., left summit at 10:00, trailhead at 2:15 pm. Roundtrip 10 hr 15 mins. I’d read on the web about several people taking about 12 hours to hike Chirripó, the usual being 7 hours up and 5 hours down, so decided that I could do the same thing. Tanya and I wanted to go to Monteverde and Arenal as well and we didn’t want to spend more than one day down at Chirripó, so I decided I’d just do what I could in one day. Either I got to the top or didn’t, but we’d be leaving the following day. We took a bus from San Jose to San Isidro, then a taxi up to San Gerardo ($25) (tip: buy your return bus ticket as soon as you arrive in San Isidro to guarantee a seat on the bus). Also on the bus was a girl from New Zealand with her parents who were all planning on hiking Chirripó. We all ended up at the Ranger Station in San Gerardo at the same time, where the New Zealanders discovered they couldn’t go up the following day because there were no spaces at Base Crestones, the accomodation about 5 km from the summit. I was told that I couldn’t go up either, even though I was planning on doing the trip in one day. It didn’t seem to make any sense, but Oscar, the guy we were talking with explained that a lot of people say they will do it in a day, then once they are up high, they realize they are tired, or have blisters, or have sore legs, and want to stay at Base Crestones. I said I’d hike up for 7 hours then turn round, wherever I was and finally Oscar relented and said OK. When I tried to pay for my day pass he refused to take any money. I had read the Lonely Planet guidebook description which said the gate opens at 4 a.m. and no one is allowed to start after 10 a.m. Well, I didn’t see any gate that was locked and no one wanted to see my permit. If you are planning on doing the hike in a day, I’d say don’t even bother getting a permit. It seems that you only need a permit if you want to stay at Base Crestones. We stayed at El Uran, which is a lovely little hotel with a restaurant about 50 yards from the trailhead. If you stay there, try to get a room on the upper floor with a view over the valley. The New Zealanders stayed next door at Casa Mariposa, where the parents got a room and the daughter stayed in the dorm. During the night a tarantula fell onto her pillow beside her face. She didn’t sleep after that. The next day (April 18) I started hiking with a headlamp at 4 a.m. after a breakfast of two bananas. By 5:10 it was light enough to put away the headlamp. The trail is really obvious and has markers every kilometer. 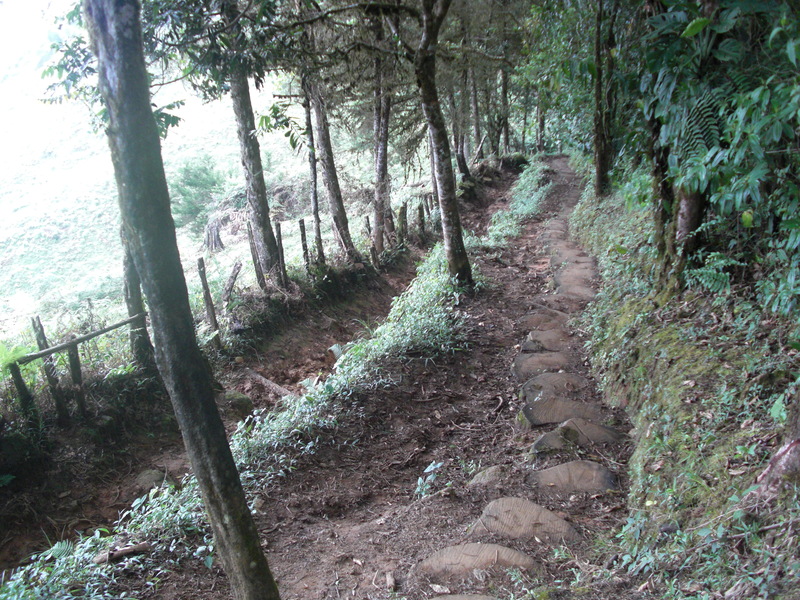 Because it rains a lot, and because horses go up to Base Crestones carrying people’s packs, parts of the trail get very muddy and there are parallel trails for hikers and horses, where the hikers trail often consists of stepping stones made of cut-down tree trunks. I didn’t carry much water because it was early, and because just before the 8 km mark there is a shelter that has a tap which constantly flows, or rather drips, with drinkable water from some spring. The last two km before the tap are pretty much flat and even some slight downhill. The Lonely Planet guide says that Base Crestones is 10 km from the trailhead, so after I filled up with water I figured I’d soon be there. However, it turns out that the guide is wrong, and that it’s actually 14.5 km from the trailhead to Base Crestones (the National Park boundary is 4 km from the trailhead, so perhaps the writer got confused by that). I realized that the hike was going to be about 8 km longer than I’d anticipated, but what to do? At about 8 or 9 km I started seeing people coming down, in twos, threes, fours, and even larger groups. By the time I reached Base Crestones at 8:20 a.m. I’d seen 53 people walking down, presumably all having been to the summit and back by this time. Amazingly, from Base Crestones to the top of Chirripó I saw no one. But I’m getting ahead of myself. 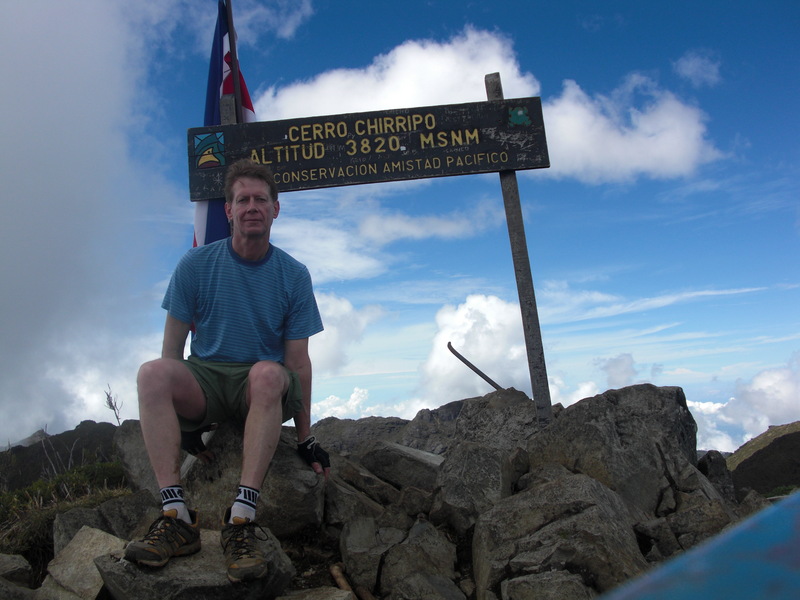 You crest out initially at Monte Sin Fe (mountain of no hope) at 3200 meters, then amazingly, you start hiking downhill for quite a way – it felt like several hundred feet of elevation loss. 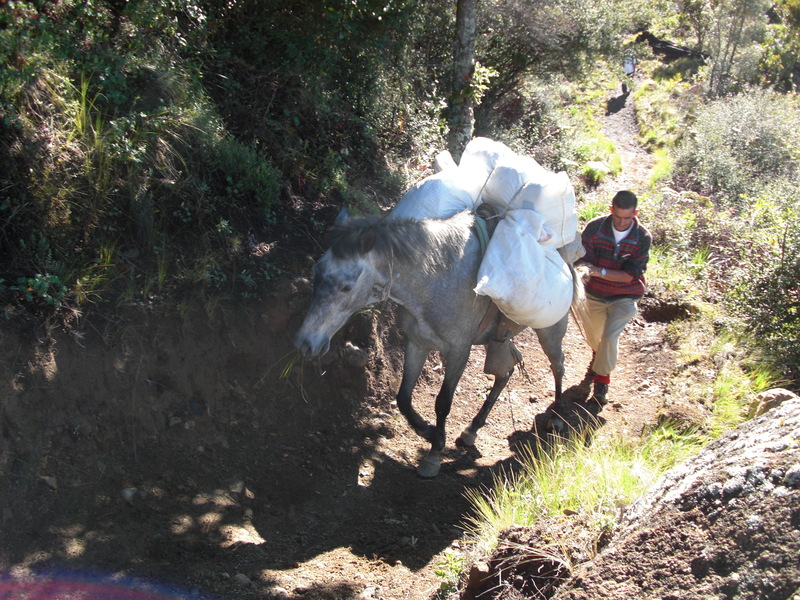 As I was hiking down two packhorses were coming up, carrying huge white bags that obviously contained the packs of many of the hikers I’d passed. Then there’s more uphill to regain the lost ground and another 200 meters of elevation gain, and finally you reach a lovely view of Base Crestones at an elevation of 3400 meters. A short easy downhill and I was there. From Base Crestones it’s 5.1 km to the top and it’s pretty easy going compared to what you’ve already done, being almost flat in places and gently uphill in others. As I walked I tried to figure out which peak was Chirripó, but no peak seemed any higher than the others. Eventually I got to a T-junction and the trail to Chirripó led left. It started getting a little steeper, although still relatively easy, but it was still difficult to tell which summit was Chirripó. Finally I realized that none of the peaks I was looking at were Chirripó, and that Chirripó lay further back, past a small saddle. A short traverse leads to the summit ridge which is beautiful – much steeper and with some rocky steps, but not too long, and then you are at the top. Strangely, all the way up the summit ridge I was looking around and wondering if Chirripó was really the highest peak. Other peaks simply looked higher, and even at the summit it wasn’t obvious that Chirripó is the highest. 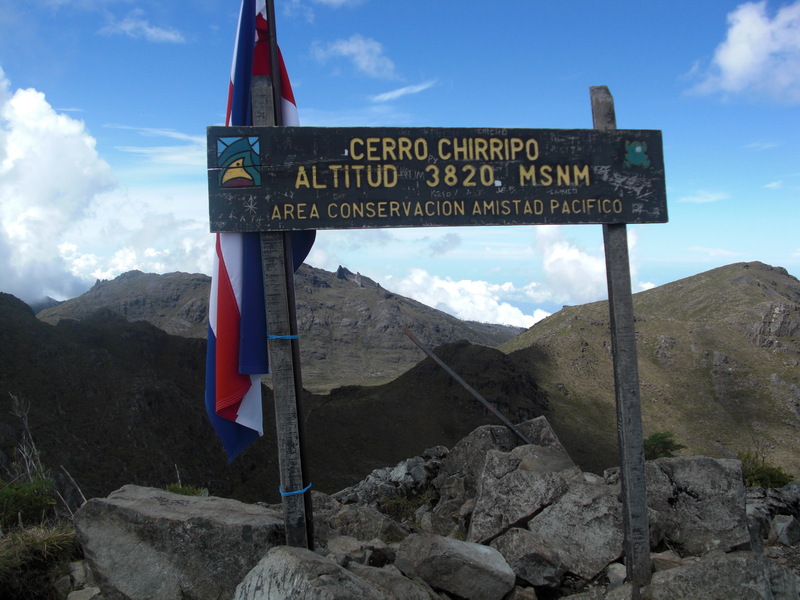 Apparently there are two other peaks that are higher that 3,800 meters (Cerro Ventisqueros is 3,812 meters and thus only 8 meters (26 feet) lower than Chirripó), and others not far below that. So it’s quite difficult to tell that you really are on the highest peak. After 15 minutes on the top, most of which was spent trying to get my camera to take a delayed photo of me in front of the summit sign 😦 I headed down. 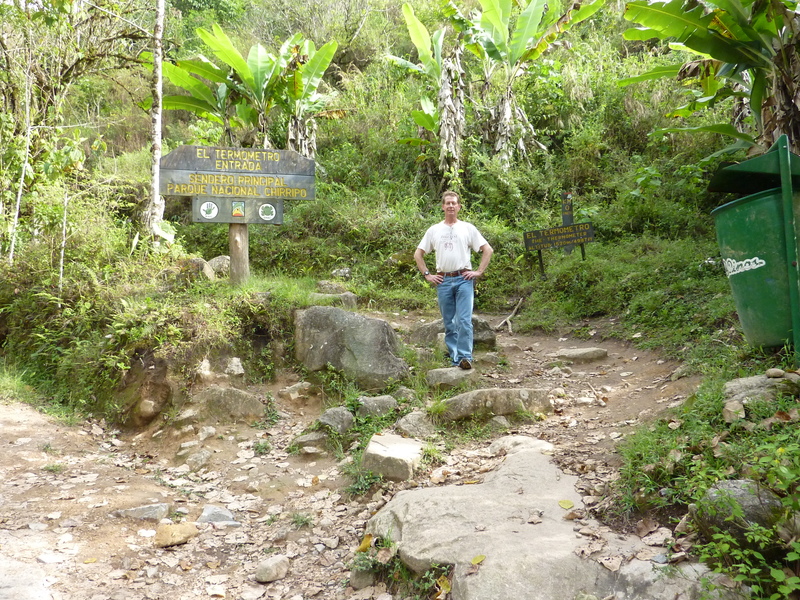 After climbing back several hundred feet (or so it felt) to Monte Sin Fe I finished what water I had left and started the long steep descent to San Gerardo, filling up with water again at the dripping tap. After reaching the hotel I had a late lunch of hamburger and fries – delicious! The next day we got a taxi down to San Isidro (we arranged with the driver who drove us up from San Isidro to bring us back down), then got the bus to San Jose, got a taxi across town to another bus station, then caught the bus to Monteverde – a long day of traveling. I realize I was lucky to have great weather for my hike – a cloudless, starry night to start, blue skies past Base Crestones, clouds starting to come in as I approached Chirripo, clouds as I descended below Monte Sin Fe, then sunny skies again once I was down. 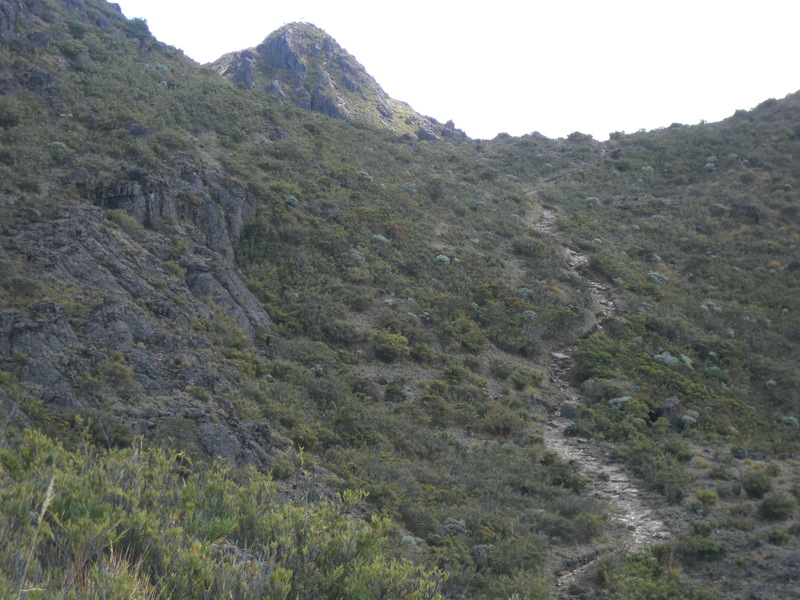 Many people aren’t as fortunate and have to face afternoon rains, which is why the usual practice is to get up early and hike to Base Crestones, hang out for the rest of the day, then get up early the following day for the summit climb. But hey, that’s why I had an umbrella with me :-). 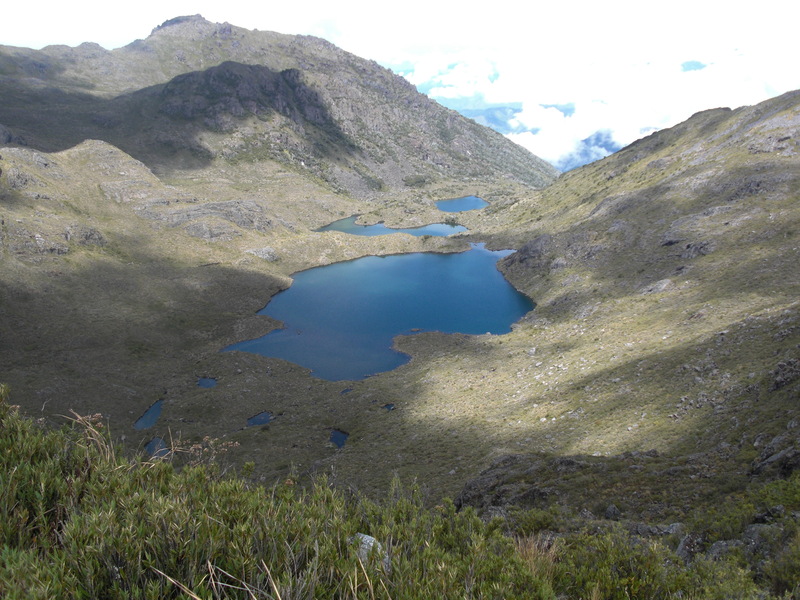 Here’s a view of Valle de los Lagos (valley of the lakes) from the summit. Great article. After spending most of the morning contemplating the ‘up and down in a day’ idea, this article has been the most helpful. Thank you. Your analytic approach is much appreciated.